benzyrnill, 旎宫嘉坊: peacefull sunny morning. these days sunny weather dominating the climate, let it a breeze in office or on the way home. the earthquake in Sichuan, central China, didn't shock me much. i neither read much news coverage. the human habitant had made the earth of their own nest and any tiny unstable locally can claim lots of life's losing. the whole body of human community had grown stronger and stronger and losing of a limb didn't mean much for the rest of the live body. 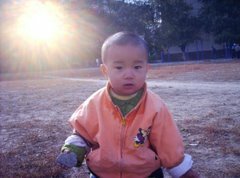 my baby these days refused to join kindergarten and was cared by the grandma in work time. i was more or less worried if he can be familiar with his peers, and merging into the peerage. i don't want he too obsess with schooling or study but he should keep in contact with his peer and good at communication with them. God, my Lord, i need ur guide even more urgent. dips China into fire-baptism with its revenge.